How did a ragtag band of nobodies from the far edges of the Mediterranean world become such a dominant force in just two and a half centuries? The historical sociology of this extraordinary phenomenon has been explored by Rodney Stark of Baylor University, who argues that Christianity modeled a nobler way of life than what was on offer elsewhere in the rather brutal society of the day. In Christianity, women were respected as they weren’t in classical culture and played a critical role in bringing men to the faith and attracting converts. In an age of plagues, the readiness of Christians to care for all the sick, not just their own, was a factor, as was the impressive witness to faith of countless martyrs. Christianity also grew from within because Christians had larger families, a byproduct of their faith’s prohibition of contraception, abortion and infanticide. For theologians who like to think that arguments won the day for the Christian faith, this sort of historical reconstruction is not particularly gratifying, but it makes a lot of human sense. Prof. Stark’s analysis still leaves us with a question, though: How did all that modeling of a compelling, alternative way of life get started? And that, in turn, brings us back to that gaggle of nobodies in the early first century A.D. and what happened to them. What happened to them was the Resurrection Effect, called by some the ‘Easter Effect’. There is no accounting for the rise of Christianity without weighing the revolutionary effect on those nobodies of what they called “the Resurrection”: their encounter with the one whom they embraced as the Risen Lord, whom they first knew as the itinerant Jewish rabbi, Jesus of Nazareth, and who died an agonizing and shameful death on a Roman cross outside Jerusalem. As N.T. Wright, one of the Anglosphere’s pre-eminent biblical scholars, makes clear, that first generation answered the question of why they were Christians with a straightforward answer: because Jesus was raised from the dead. It was no less challenging two millennia ago than it is today. And one of the most striking things about the New Testament accounts of Resurrection, and what followed in the days immediately after, is that the Gospel writers and editors carefully preserved the memory of the first Christians’ bafflement, skepticism and even fright about what had happened to their former teacher and what was happening to them. And the second thing it tells us is that it took time for the first Christians to figure out what the events of the Jesus’ death and resurrection meant—not only for Jesus but for themselves. As they worked that out, their thinking about a lot of things changed profoundly. The way they thought about time and history changed. During Jesus’ public ministry, many of his followers shared in the Jewish messianic expectations of the time: God would soon work something grand for his people in Israel, liberating them from their oppressors and bringing about a new age in which (as Isaiah had prophesied) the nations would stream to the mountain of the Lord and history would end. The early Christians came to understand that the cataclysmic, world-redeeming act that God had promised had taken place after the resurrection. God’s Kingdom had come not at the end of time but within time—and that had changed the texture of both time and history. History continued, but those shaped by the Resurrection Effect became the people who knew how history was going to turn out. Because of that, they could live differently. The Resurrection Effect impelled them to bring a new standard of equality into the world and to embrace death as martyrs if necessary—because they knew, now, that death did not have the final word in the human story. The way they thought about “resurrection” changed. Pious Jews taught by the reforming Pharisees of Jesus’ time believed in the resurrection of the dead. The resurrection taught the first Christians, who were all pious Jews, that this resurrection was not the resuscitation of a corpse, nor did it involve the decomposition of a corpse. Jesus’ tomb was empty, but the Risen Lord appeared to his disciples in a transformed body. Those who first experienced the Resurrection Effect would not have put it in these terms, but as their understanding of what had happened to Jesus and to themselves grew, they grasped that there had been a mammoth leap in the human condition. A new way of being had been encountered in the manifestly human but utterly different life of the one they met as the Risen Lord. The way they thought about their responsibilities changed. What had happened to Jesus, they slowly began to grasp, was not just about their former teacher and friend; it was about all of them. His destiny was their destiny. So Jesus’ death and resurrection not only allowed them to face opposition, scorn and even death with confidence; they could offer to others the truth and the fellowship they had been given. Indeed, they had to do so, to be faithful to what they had experienced. And that mission would eventually lead these sons and daughters of Abraham to the conviction that the promise that God had made to the People of Israel had been extended to those who were not sons and daughters of Abraham. Because of Jesus’ death and resurrection, the Gentiles, too, could be embraced in a relationship – a covenant – with the one God, which was embodied in righteous living. (Source) Men and women attend a church service in Tehran, Iran, in this undated photo. The way they thought about worship and its temporal rhythms changed. Recognizing that does not, of course, convince everyone. Nor does it end the mystery of Easter. The first Christians, like Christians today, cannot fully comprehend resurrected life: the life depicted in the Gospels of a transphysical body that can eat, drink and be touched but that also appears and disappears, unbothered by obstacles like doors and distance. However important the role of sociological factors in explaining why Christianity carried the day, there also was that curious and inexplicable joy that marked the early Christians, even as they were being marched off to execution. Was that joy simply delusion? Denial? 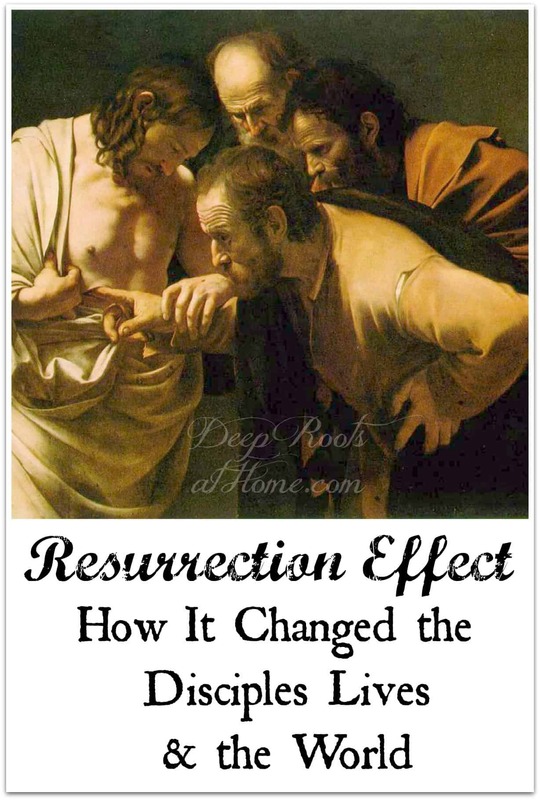 Perhaps it was the Resurrection Effect – the joy of people who had become convinced that they were witnesses to something inexplicable but nonetheless true. Something that gave a superabundance of meaning to life and that erased the fear of death. Something that had to be shared. Something with which to change the world. « Don’t Let Satan’s Attacks & Arguments Wear You Out!